Oh Baby, Don’t You Weep: TITLE TOWN returns with guest DJ JUDDY! 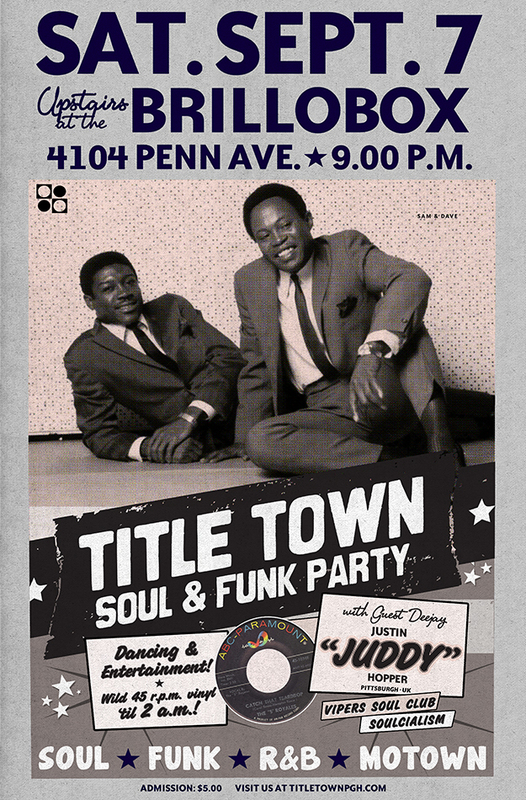 TITLE TOWN Soul & Funk Party w/ guest DJ JUDDY (Pittsburgh, UK) SATURDAY, September 7th BRILLOBOX (4104 Penn Avenue, Pittsburgh) 9pm – 2am; $5 Oh Baby, Don’t You Weep because the Dream Team is BACK, September 7th at BRILLOBOX! Attention: Pittsburgh – put on your red dress and your hi-heel sneakers because the dream team is back: The one-two punch that made you shake your head and get outta bed; the serious heavyweights, the greats of the stay-up-lates; the purveyors of Maximum R’n’B, spinners of platters what matters from time immemorial – back together again, Mssrs. GORDY G and JUDDY bringin’ down the TITLE TOWN! While Gordy’s name is the one that makes all fliers get higher, you gotta ask your mama and your papa if you wanna know about Gentleman Juddy: Once sire of Pittsburgh’s soul shakin’ scene, since the dawn of the 21st Century, Juddy’s made a mess with a stack of rare-n-scratchy NORTHERN SOUL, NEW ORLEANS VIPERS, ’50s R&B & BLUES and ’60s BOOGALOOS as co-founder of influential nights like Soulcialism and Vipers Soul Club. And now he’s back from for ONE NIGHT ONLY all the way from London, England, to spill your drink and make ya think! TITLE TOWN. It’s a hedonistic throwback to the days of Memphis juke joints and funky New Orleans soul, Pittsburgh record hops and Manchester’s Twisted Wheel club. You can lose your cool and cure your dance fever to the soulful sounds of GENO WASHINGTON and THE 5 ROYALES, hear vintage club tracks from RALPH “SOUL” JACKSON and ERMA FRANKLIN and party ‘til the wee hours with disco and modern soul sounds of EDDIE KENDRICKS and LARRY MCGEE. We need you. And you need it too. Come out, shake it down, and help show Juddy the Burgh’ hasn’t skipped a beat. Tell us you're comin': RSVP here.